Strategies and Trends for Mid-Rise Construction in Wood and a new case study, the Brock Environmental Center, winner of the Sustainable Building Industry Council’s Beyond Green® Honor Award, the top prize in the High-Performance Buildings Category. WBDG also has updated the Secure/Safe Design Objective sections of the website, including new content about Resilience and Storefront Safety. The National Institute of Building Sciences Board of Directors has approved the submissions for the incoming 2017 Council and Committee Leadership Teams. The Institute Board welcomes new leaders for the Building Enclosure Technology and Environment Council (BETEC), Building Seismic Safety Council (BSSC), buildingSMART alliance® (bSa), Consultative Council, Facility Maintenance and Operations Committee (FMOC), Multihazard Mitigation Council (MMC), National Council of Governments on Building Codes and Standards (NCGBCS) and Off-Site Construction Council. Each year, members of the Institute’s standing Councils and Committees vote on new leadership. The results of their vote are then submitted to the Institute Board of Directors for acceptance. The leadership of each Council and Committee is critical to the mission of the Institute. These elected leaders guide their respective programs, working to achieve the goals of their respective Council or Committee. View the Institute’s Councils and Committees. 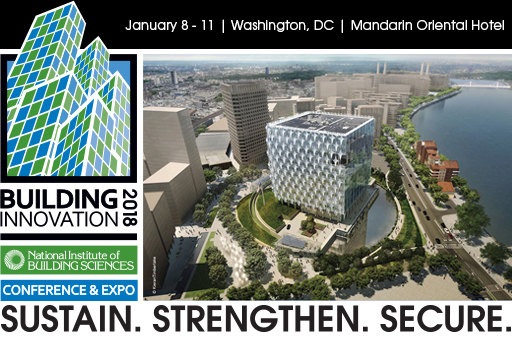 Building Innovation 2018: The National Institute of Building Sciences Sixth Annual Conference & Expo will explore strategies that improve the built environment. Plan to be there where Science meets Design™ during the week of January 8 – 12, 2018, at the Mandarin Oriental in Washington, D.C. Find out more and sign up for updates. To learn about sponsorship, exhibitor and advertising opportunities, email ptowns@nibs.org. Earlier this month, the National Institute of Building Sciences issued a Communication on Engagement (COE) reaffirming its support to the world’s largest corporate responsibility initiative, the United Nations (UN) Global Compact. Two years ago, the Institute initiated its relationship with the UN Global Compact, a strategic policy initiative for businesses that are committed to aligning their operations and strategies with 10 universally accepted principles in the areas of human rights, labor, environment and anti-corruption. Read the announcement. National Institute of Building Sciences Board Member Cindy Davis, deputy director of building and fire regulations at the Virginia Department of Housing and Community Development, and Institute Member Steven Orlowski, the director of codes and standards at the Building Owners and Managers Association International, talked codes with Architect Magazine Editor Wanda Lau on this podcast, ArchitectChats, Episode 11: Dissecting the Code, Part 1 — Raising Expectations. Hear what they had to say. 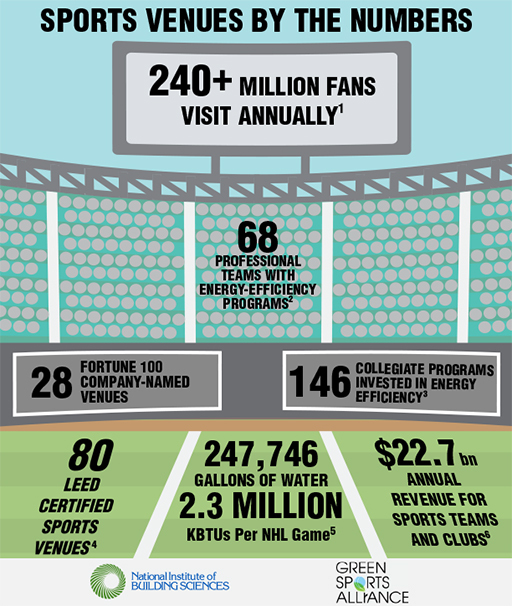 The National Institute of Building Sciences and the Green Sports Alliance, through an effort initiated by the U.S. Department of Energy (DOE), teamed up last year to better assess how stadiums and arenas are taking on the challenge of energy and water efficiency. DOE posted this blog, written by Institute Presidential Advisor Ryan M. Colker, J.D., to draw attention to the report, which came out earlier this year, and to gain additional survey responses from stadium and arena owners on their energy and water-saving efforts. Take a look. The Building Seismic Safety Council (BSSC) will host the third webinar in its 2017 construction materials series sponsored by the Federal Emergency Management Agency (FEMA). The free webinar, “Design of Seismic Force-Resisting Systems in Steel-Framed Buildings,” will be held Friday, April 21, 2017, from 2:00 pm to 3:00 pm ET (11:00 am to 12:00 pm PT). The webinar highlights the National Earthquake Hazards Reduction Program (NEHRP) 2015 NEHRP Recommended Seismic Provisions for Buildings and Other Structures, as well as its supporting materials, FEMA P-1051 Design Examples and FEMA P-1052 Training Materials. 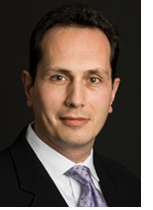 Presenter Rafael Sabelli will introduce the design of seismic force-resisting systems in steel-framed buildings intended to complement the design problems in Chapter 9 of the FEMA P-1051 Design Examples. He also will discuss the design of ordinary concentrically braced frames, special concentrically braced frames and special moment frames. Sign up now to attend the webinar. View the full webinar schedule. Want to learn about securing retail buildings? Richard Paradis, PE, BSCP, Bd. Cert. NCE, the Institute’s Program Director for the WBDG Whole Building Design Guide®, will give a presentation on the topic April 20 in Dallas/Ft. Worth, Texas. Paradis is speaking at the Professional Retail Store Maintenance (PRSM2017) Conference. His presentation will be on "The Ins and Outs of Designing, Building and Maintaining a Secured Building." Find out more about his presentation. The National Institute of Building Sciences Building Enclosure Technology and Environment Council (BETEC) and the Building Enclosure Council – Philadelphia are seeking abstracts for papers for presentation at the fifth BEST Conference Building Enclosure Science and Technology™ (BEST5), to be held April 2018 in Philadelphia, Pennsylvania. The BEST5 Technical Committee will select approximately 60 abstracts related to building science research, design or practice for conference papers and presentations, panel presentations and poster presentations. Presenters have until June 15, 2017, to submit an abstract. During the three-day Conference, researchers and practitioners will share knowledge and lessons learned concerning the science and art of the building enclosure. 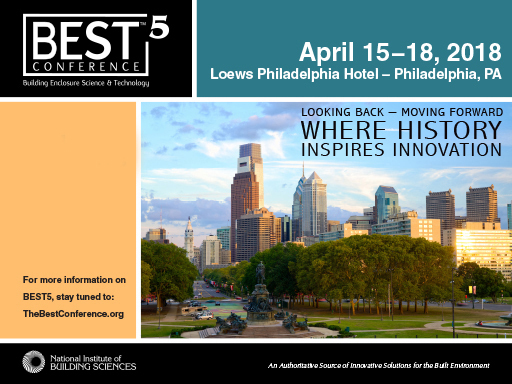 BEST5 will consist of concurrent technical sessions, plenary addresses, a Building Enclosre Commissioning (BECx) workshop and special programs highlighting Philadelphia’s building technology heritage. The Conference also will feature an exhibit hall with opportunities for one-on-one discussions with industry vendors of state-of-the-art building industry products and services. View the topics to be considered. Want to learn more about game-changing innovative technologies from some of the industry’s cutting-edge experts? Join two panels, including Institute Program Director Roger Grant, CSI, CDT and Institute members Kimon Onuma, Stephen Hagan, Dennis Shelden and Jonathan Widney, for this two-part pre-conference session at the American Institute of Architects (AIA) Conference on Architecture 2017, April 26 in Orlando, Florida. Attend WE112: Game Changing Innovation: Designing the Future of Architecture, Construction and the Built Environment, Part I (8:00 am – 12:00 pm) and WE313: Game Changing Innovation: Designing the Future of Architecture, Construction and the Built Environment, Part II (1:00 pm – 5:00 pm) to learn how innovative technology, such as building information modeling (BIM), geo-spatial platforms and big data are changing the way buildings are being designed and constructed. Watch some of the speakers discuss the upcoming AIA session on this episode of Buiding Leaders on ARCH-i-TECH.TV.